July marks the setting of the cornerstone for the first and only home of the Tennessee General Assembly. The Tennessee State Capitol Building in Nashville was laid out July 4, 1845, to great fanfare and ritual, one month after the death of the state’s great hero, Andrew Jackson. Completed in 1859, the building has served since then, with little modification, as the seat of Tennessee’s government. In June 1844, William Strickland was approached about designing a capitol for the state of Tennessee by the Board of Commissioners charged with “superintending the construction of the State House.” A civil engineer and prominent architect, Strickland was one of the first to advocate the use of steam locomotives on railways and was a founder of the Greek Revival movement in the United States. 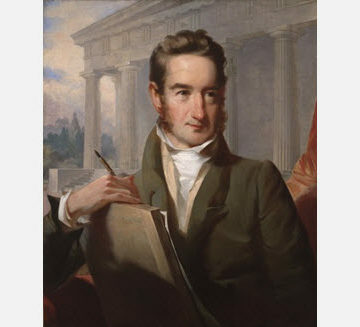 At the age of 14, Strickland apprenticed under Benjamin Henry Latrobe, one of the designers of the U.S. Capitol. Strickland produced many notable buildings and engineering works such as the Bank of the United States building in Philadelphia, restoration of the tower over Independence Hall, plans for a canal from the Chesapeake Bay to the Delaware River, and the Delaware Breakwater. In the 1820s, Strickland visited England on a reconnaissance mission to learn canal technology. While there, he also studied English railways and influenced the transfer of railroad technology to the United States. In May 1845, Strickland was appointed architect for the State House at an annual salary of $2,500, payable quarterly. While creating his designs for the Tennessee State Capitol Building, Strickland reviewed the antiquities of Athens, the inspiration that led to him achieving his version of a Greek temple. The porticoes on all four sides of the building resemble the Erectheum in Athens. The tower is a copy of the Choragic Monument of Lysicrates in Athens, which Strickland also copied for the cupola of his earlier Merchants’ Exchange Building in Philadelphia. 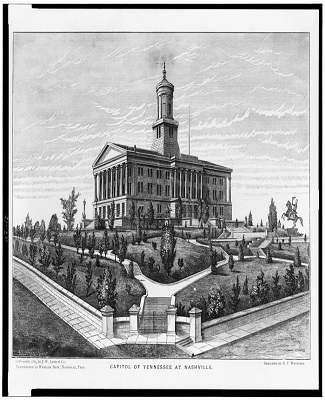 Strickland’s design of the Tennessee Capitol combined one of the most ancient building materials, monolithic cut stone, with one of the newest at the time, structural iron. For part of the tower and most of the roof, monolithic cut stone was used to make the building almost fireproof. The limestone used was quarried about a mile from the capitol site. Many of the interior columns of the building are one piece of stone. Construction implemented massive wood timbers to form derricks for hoisting the stones into place. The capitol was roofed and enclosed during 1852; 210 tons of round and flat iron bars were produced for the roof trusses and 3,000 sheets of copper, weighing 27 tons, were ordered for the roof. Strickland specified that iron was to be used for the roof trusses at a time when most bridges were still being made out of wood. The trusses are constructed of wrought iron instead of the cheaper cast iron due to wrought iron’s superior mechanical properties. 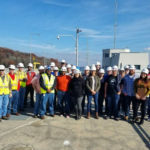 In addition to producing roof trusses that have performed reliably over the years, the project introduced the local iron industry to the material’s engineering uses and spurred the development of the iron industry in Tennessee. On April 1, 1854, Strickland died suddenly and was succeeded by his son Francis Strickland. He is buried within the walls of the State Capitol Building and following his wishes, his tomb is visible at the northeast corner of the building near the north entrance. The Board of Commissioners resolved to pay his funeral expenses and place “a suitable inscription…upon his tomb in the capitol.” The Tennessee State Capitol is the last of Strickland’s buildings to be completed. In 1860, with the building construction essentially finished, the state contracted J. A. Haydon, a local civil engineer, to produce a topographic map of the grounds. Work on the grounds was halted in April 1861, due to the start of the Civil War and a lack of funds. In 1870, the legislature approved completion of the grounds but only a portion of Haydon’s 1860 survey could be found. 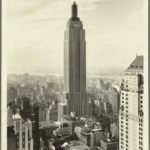 In order to complete the work, John Bogart, a civil engineer from New York City, was hired to produce a suitable plan. Upon completion, these gardens were an early example of a large public park in Tennessee and set the standard for park development in the region. The Tennessee State Capitol Building was dedicated as an ASCE National Historic Civil Engineering Landmark in 2003.